When he's thirsty, he's thirsty! Loki, a rainbow lorikeet, definitely knows what he likes to drink. 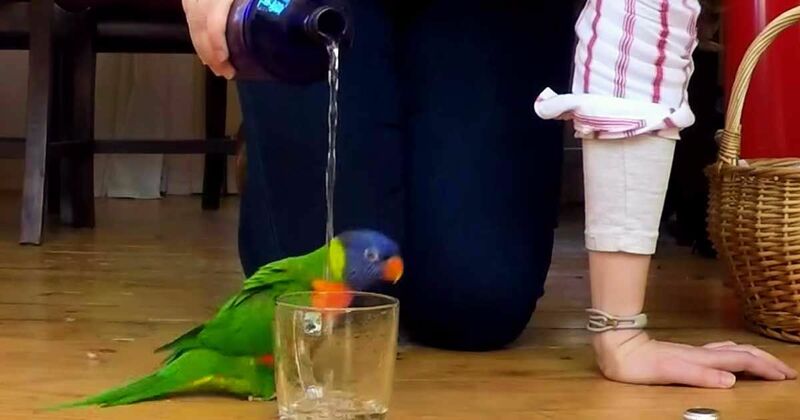 Check out his adorable reaction when his owner pours him a cool glass of water to sip. His hops and bounces make it look like he's just won the lottery. This adorable bird has quite the following, with nearly 10,000 people keeping up with his daily routines via Instagram. Rainbow lorikeets like Loki are smaller birds, usually only about 12 inches tall. The rainbow shades found in their feathers inspired their name. Native to Australia, lorikeets are outgoing and loud. These birds need their playtime and can be a bit mischievous. What do you think about this adorable bird? Share this video with your friends on Facebook.